Army Recruitment Rally is being conducted at Gopalpurr by Army Recruitment Office, Sambalpur. In the interest of the public specially the multitude of the young population. You are requested to give wide publicity of the rally through English/Hindi/Oriya language. 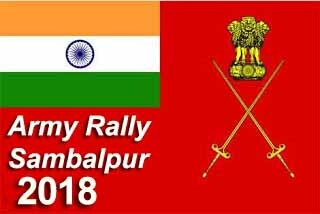 Army Recruiting office Sambalpur is organizing Army Recruitment Rally for the category of Soldier General Duty, Soldier Technical, Soldier Clerk/Store Keeper and Tradesman for the male candidates of Angul, Balangir, Bargarh, Deogarh, Dhenkanal, Jharsuguda, Keonjhar, Sambalpur, Subarnpur and Sundargarh districts of Odisha. Detail information can be obtained from joinindianarmy.nic.in website. Candidates will have to apply online at joinindianarmy.nic.in to appear in recruitment rally. Online application will start on 30 JAN 2018 TO 15 MAR 2018, Admit card will be sent on e-mail before 10 days of commencement of Rally bharti. Sol Technical,Tech Aviation/Ammunition Examiner/Sol Tech (NA & NA-veterinary) Sol Clerk/Storer keper, Tradesman : 17 years Six month to 23 years. 1.6 Kilometer Run for all category. Grouping and marks will be awarded as below.